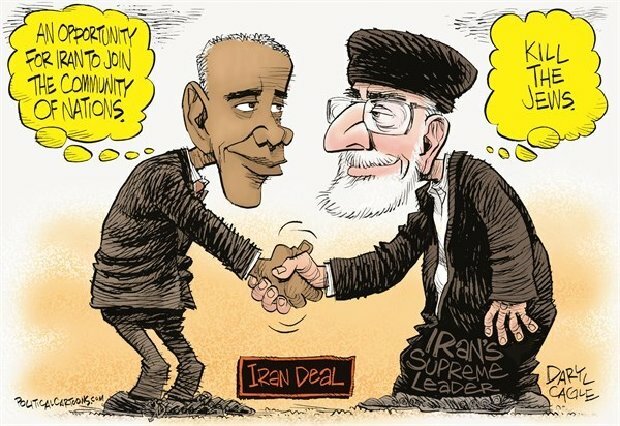 Desperately striving to garner favor of the Iranian Muslim government, Obama now adds gifts of “nuclear equipment” to sweeten the bribe. So much in common: hatred for Christians and Jews. What can go wrong? This for me is déjà vu all over again. Wasn’t it about 1994 when another idealistic Democrat president sought détente (French word Secretary John Kerry would understand) with tyrannical Korea? Here’s a side-by-side comparison of statements of Democrat presidents Clinton and Obama. Clinton: This agreement will help to achieve a longstanding and vital American objective: an end to the threat of nuclear proliferation on the Korean Peninsula. Obama: …Iran will never be permitted to develop a nuclear weapon. Clinton: It does not rely on trust. Obama: So this deal is not based on trust, it’s based on unprecedented verification. Clinton: Compliance will be certified by the International Atomic Energy Agency. Obama: …what we’re going to be doing is setting up a mechanism whereby, yes, I.A.E.A. (International Atomic Energy Agency) inspectors can go anyplace. 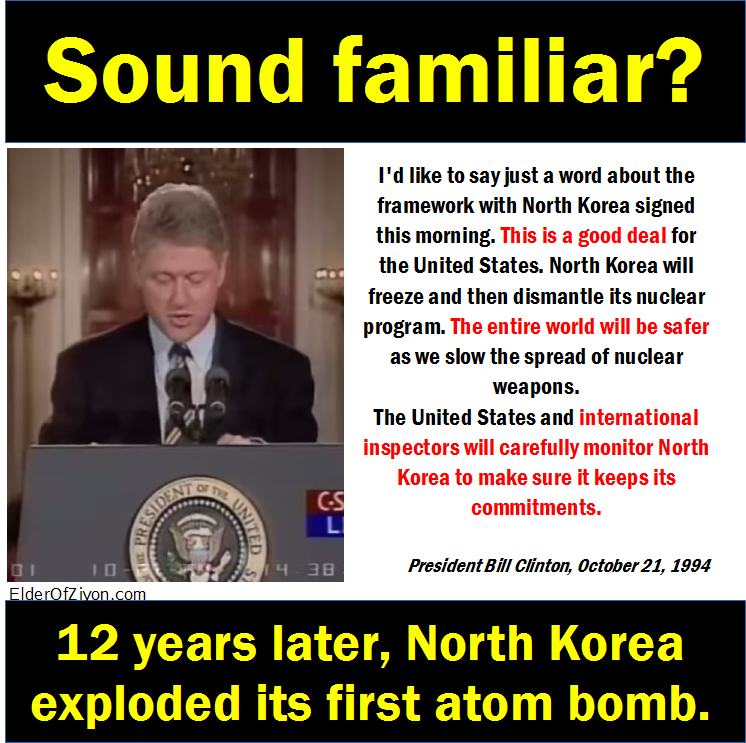 Clinton: Under the agreement, North Korea has agreed to freeze its existing nuclear program and to accept international inspection of all existing facilities. Obama: …a deal to stop the progress of Iran’s nuclear program and roll it back in key areas. Clinton: This agreement represents the first step on the road to a nuclear-free Korean Peninsula. Obama: This framework would cut off every pathway that Iran could take to develop a nuclear weapon. Clinton: …we have completed an agreement that will make the United States, the Korean Peninsula, and the world safer. Obama: …if this framework leads to a final, comprehensive deal, it will make our country, our allies, and our world safer. Clinton: The United States and North Korea have also agreed to ease trade restrictions and to move toward establishing liaison offices in each other’s capitals. Obama: In return for Iran’s actions, the international community has agreed to provide Iran with relief from certain sanctions — our own sanctions, and international sanctions imposed by the United Nations Security Council. Clinton: These offices will ease North Korea’s isolation. Clinton: This agreement is good for the United States, good for our allies, and good for the safety of the entire world. Obama: And it is a good deal, a deal that meets our core objectives … we are more likely to be safe, more likely to be secure, in a better position to protect our allies. Clinton: It’s a crucial step toward drawing North Korea into the global community. Obama: …there was an appetite among the Iranian people for a rejoining with the international community. Clinton: And the United States has an unshakable commitment to protect our ally and our fellow democracy South Korea. Obama: …a very clear message to the Iranians and to the entire region that if anybody messes with Israel, America will be there. Clinton: We will continue to work closely with our allies and with the Congress as our relationship with North Korea develops. Obama: But I say that hoping that we can conclude this diplomatic arrangement — and that it ushers a new era in U.S.-Iranian relations — and, just as importantly, over time, a new era in Iranian relations with its neighbors. So you know, al taqiyya is a Muslim’s ‘license to lie’, as prescribed in Quran sura 3:28. Barack Obama was partly raised in a Muslim country where he was educated in the religion of Islam. Therefore, he must know this verse, this sura. To be perfectly clear, Iran has no desire whatsoever to rejoin the “global community”. The goal of Muslims is to dominate the entire world via Sharia law and the teachings of Islam. The goal is one unbroken, worldwide caliphate intolerant of any other religion, totally opposed to democratic principles. Tell your two U.S. senators to oppose ratification of any treaty Barack Obama drags home from his one-sided talks with Iranian negotiators. It’s not the Supreme Law of the Land until the Senate ratifes.